Comfortably seated in our bus, minibus or car, our licensed guide will accompany you first of all to the Wilhering cathedral, one of the most beautiful monuments in Rococo all around Austria. We will continue our excursion to Eferding where we will visit the impressive gothic church and we will discover the streets of the city of Eferding during a guided walk. It is possible, if you want, to include in our tour a visit of the museum of the Starhemberg castle. Then we will leave Eferding to go to Wels. There, we will visit Wels castle (place where Emperor Maximilian the first is dead), the house of the archbishop's mistress Salome Alt, the monastery of the Friars Minor, the tower of tanners, the parish church, the water tower and the Polheim castle. 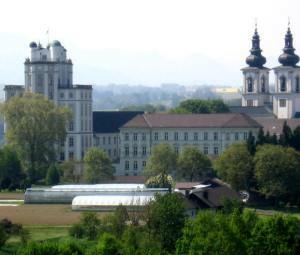 After we have lunch in a typical place of Upper Asutria, we will go to Kremsmünster abbey. During our guided tour, we can admire the impressive marble hall, the library and the cathedral. We will talk about studies of Adalbert Stifter at the abbey high school and we will discover the world-wide famous "Tassilo chalice" and a lot of other marvels of the city. We will continue our tour with a walk in the monastery gardens and we will see the huge fish pond dating from the Renaissance and also the cellar and the abbey's restaurant. To end our excursion, we will go back to Linz after we have enjoy a little free time where it will be possible to buy souvenirs of our visits. The excursion offered by Linz Tours can be modified depending on your desires and time you have to take part in our excursion in Eferding, Wels and Kremsmünster. For example, if you want, it is possible to visit Eferling after Kremsmünster, and have lunch in the restaurant of the abbey to visit Wels after that. If you are interested in our excursion in Eferding, Wels and Kremsmünster and if you want information about possible changes, please let us know by email. Linz Tours is a service presented by the tour operator City Tours, a company specialized in organization of tailor-made sightseeing tours. You will find more information about Linz Tours and City Tours by clicking on the button entitled "legal notice". You can also inquire about our partners and about other tours offered by City Tours Austria.